Alcohol, a mis-matched tyre set-up and excessive speed led to the tragic deaths of two chefs, an inquest heard today (Thursday, January 25). 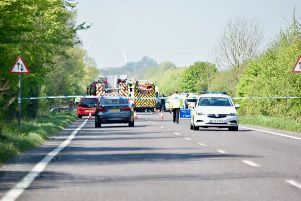 Friends Florin Cristian Radu, 33, and Florin-Adrian Mateas, 43, both born in Bucharest, Romania, died from severe injuries after a rear wheel drive blue BMW, driven by Mr Radu, collided with a tree just before midnight at Coopers Green, Uckfield, on July 20 last year. Blood tests on Mr Radu revealed he was one-and-a-half times over the legal drink-driving limit. The Eastbourne inquest heard the pair, who both worked as chefs at The Pig and Butcher, Five Ash Down, had cleared up after service that evening and headed to The Ringles Cross pub nearby. They were returning from there to The Pig and Butcher, where Mr Mateas lived, when the tragedy happened. Five Ash Down resident Richard Harvey was in bed watching TV when he heard “a crump or a thud”. Going to help, he saw the victims in the front of the BMW. He tried to help them out but then emergency services arrived. Police traffic investigator Paul Banks described a set-up where eight-inch tyres were smaller than the nine-inch wheel rim width. Questioned by Coroner Alan Craze he agreed the set-up, usually on performance cars, made the vehicle harder to steer. In his opinion, skid marks indicated a speed of between 70-99mph, “the higher level was the more likely”. Mr Craze agreed that this, combined with Mr Radu’s alcohol level and the difficulty of steering once the BMW’s rear slipped away, contributed to the crash. Mr Radu, of Blois Road, Lewes, moved to the UK to work in 2004 and met his wife Barbara, 33, while working together at The Green Man pub in Ringmer. The couple had two daughters, Alicia and Julia.